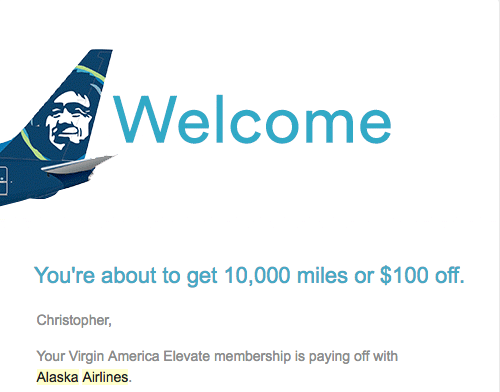 Today Alaska Airlines sent an email to Virgin America Elevate members with a nice gift: 10,000 miles or a $100 discount. To get the gift, you must link your Elevate and Mileage Plan accounts by January 31. If you don’t yet have an Alaska Mileage Plan account, the email provides a new account number for you. Just click the activate button, fill out a few fields and you’re done. If you already have both Alaska and Virgin accounts, you can link them here. I linked my accounts this morning, and while Alaska says that the 10,000 mile gift will automatically show up in my Mileage Plan account, I don’t see them there yet… so it’s not instantaneous. If you link your accounts, you do not have to convert points to miles…yet. Once you go through the linking process, you’ll get this reminder: “Your Elevate and Mileage Plan accounts will both remain active. Your balances aren’t going anywhere, and in fact, you can continue to earn Elevate points or Mileage Plan miles when you fly on Virgin America or Alaska Airlines.” For now, I think it’s best to just hold on to your Virgin points and not convert them until you have a specific flight you want to redeem for… then you should examine whether it makes more sense to use miles or points for the transaction. To help explain things- and brag a bit about how its Mileage Plan is the last remaining mileage (vs revenue)-based program, Alaska created the short video below. It also points to Alaska’s robust roster of partners and destinations where you can now use your Virgin points. So where can you go on Alaska Airlines- or its many partners and for how many miles? Be sure to check out its helpful interactive award chart here. Here’s an interesting tip from reader Nick H that should make American AAdvantage members smile… has anyone tried to take advantage of this loophole yet? For those of you who are Virgin America and/or American flyers, I just discovered a neat trick. Since Alaska now owns Virgin, and Alaska is an American partner (but not in OneWorld) you can actually fly on Virgin America and get full credit as if the flight is on American. You just have to book on alaskaair.com and make sure to select AAdvantage as the program. AFTER you book, it also pulls in your status, which then makes additional seats available, i.e. premium economy and exit rows. I still consider Virgin the best domestic airline aside from the Transcon 321T to NYC on American, so this is a neat trick to me. And they fly to Hawaii, so aside from Hawaiian’s new Airbus they are also the best way to fly there! All of these are signs that business travelers stand to benefit most from the Alaska-Virgin combo. With its acquisition of Virgin, Alaska hopes to build a West Coast powerhouse. To do that, it’s going to have to win the hearts, wallets and repeat business of Virgin loyalists in the Bay Area. Shortly after the deal closed last month, Alaska offered Virgin Elevate elite members access to benefits such as priority check in and boarding on Alaska Air flights. Last week it invited Elevate members to join its Mileage Plan program and convert Virgin points to Alaska miles at a relatively generous rate of 1.3 to 1. Then it even reduced the mileage cost on many award flights. It also recently added free movies, chat and texting on flights equipped with Gogo. I expect that frequent travelers will see even more coddling like this over the next year. So it’s good news on the points/miles front. But time will tell regarding something more important: fares. We’ll be keeping an eye on those markets where Alaska and Virgin have competed keenly on price, such as SFO-SEA or LAX-SEA. Right now, you can fly roundtrip on those routes for as little as $120-$150 booked in advance, or around $250-$300 at the last minute. Let’s see if that will last.